Tek-CARE®500 is the first wireless emergency call system that can handle EchoStream (ES) and Frequency Agile (FA) transmitters at the same time! Tek-CARE®500 provides senior living facilities with the most advanced security and safety available, giving residents the peace of mind and independence they deserve. Tek-CARE®500 includes a complete selection of wireless call transmitters—including residents' pendants, emergency switches, smoke detectors, door and window monitors and passive infrared (PIR) motion detectors. 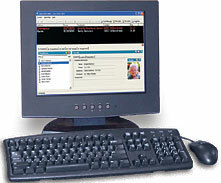 Tek-CARE®500's master station computer is the core of the system, keeping track of all transmitters and calls, and sending those calls to staff pagers (when used with the Tek-PAGING® system). The system also maintains resident photos, plus facility-determined custom information—such as contact information for relatives and physicians and medical information. All information is clearly and logically displayed on the flat-panel monitor. Residents wear waterproof pendants, allowing them the freedom to roam throughout the facility or campus knowing that help is always just a button press away. Place wireless emergency switches in baths and bedrooms for additional call locations. Be sure that residents are up and about without disturbing their privacy using the morning check-in feature of the PIR motion detector or the combination wireless assistance call & resident check-in switch. The SF530ES Wireless Call Station with 1/4" call-cord jack gives people who are temporarily bedridden or immobile access to Tek-CARE®500 call functions. Use our exclusive Remote Event Monitor software to connect up to 9 additional personal computers to the Tek-CARE®500 system via the facility's network. This software provides real-time monitoring of all system activity, as well as custom system reports. TekTone® has designed Tek-CARE®500 to work as a system. Its master station computer has been carefully designed and matched to work with Tek-CARE®500 wireless and wired peripherals. TekTone® will not warrant or support components of Tek-CARE®500 that are purchased separately unless the components are add-ons to previously sold systems. TekTone® will also not warrant or support a system that is a mix of TekTone® and Non-TekTone® parts, unless prior permission has been obtained. A site survey must be performed and submitted before ordering a Tek-CARE®500 system. In order to track our systems and to inform facilities of software upgrades, full site information (site name, address and phone number) will be required when ordering. Site information and master station computer warranty numbers will also be required when requesting technical support.